This charming thatched Grade II listed picturesque holiday cottage, part of which dates back to the 15th century is set in a most idyllic position in a quiet country lane. Right off the beaten track and surrounded by rolling countryside with views from all aspects of the cottage. Steeped in character with numerous beams, an inglenook fireplace with woodburner and natural brick and wooden floors. The large downstairs bedroom enjoys a unique galleried loft room (not suitable for small children). Other amenities are 3 adult and 1 child’s bicycle for cycling around the local lanes. With excellent road links to the historical towns of Bury St Edmunds, Diss and Stowmarket, all within ½ hours drive. Newmarket for the races, and the cities of Norwich and Cambridge all within easy driving distance as is Thetford Forest. Numerous pretty and famous villages to visit locally such as Lavenham and Long Melford. Shops and pubs ¾ mile. Ground floor: Living room with brick floor. Second living room with double sofa bed (for alternative sleeping). Dining room with wooden floor. Kitchen with ceramic tiled floor. 1 double bedroom with beams and en-suite shower room with toilet, and galleried area with 2 single mattresses (for alternative sleeping). Separate cloakroom with toilet. First floor: 3 bedrooms with beamed sloping ceilings: 2 double, one with additional single, one with en-suite bathroom with toilet, 1 single. Bathroom with shower attachment and toilet. Woodburner in living room included. Gas central heating included (extra charge October - March). Elec and bed linen included. Video and small library. DVD. Stereo/CD. Electric cooker. Washing machine. Dish washer. Freezer. Large garden with patio and furniture. Bicycles available. Ample parking. No smoking please. Holidays run from Friday to Friday. For a better idea of where Burnt House Cottage is, you can see Burnt House Cottage on the map below. 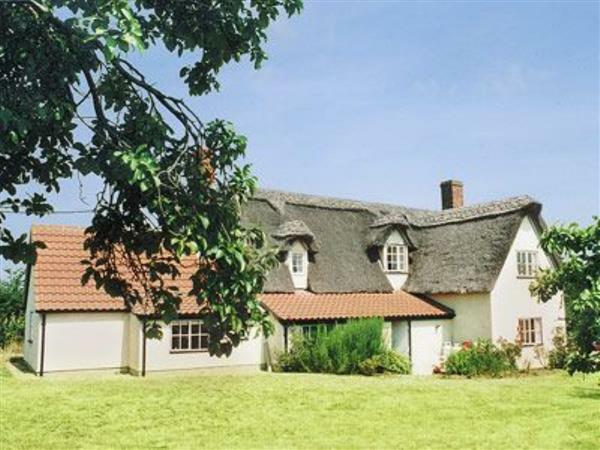 Burnt House Cottage is in Suffolk; should you be on the lookout for a special offer, you can find all the special offers in Suffolk. It's always worth checking to see what is on offer at the moment. Do you want to holiday near Burnt House Cottage (17731), you can see other cottages within 25 miles of Burnt House Cottage; have a look to find your perfect holiday location.